For various reasons some new mothers eat their own placenta. New mothers, if you have passed an infection to your child at birth and opt to later eat your placenta in pill form, don’t use the company an Oregon woman used; the pills seem to have sickened her new child with strep bacteria. This unusual event is being used to caution all new mothers against all placenta pills. Health officials are warning new moms about the potential dangers of taking pills made from their placenta, after an Oregon infant’s infection was tied to the practice. Trendy among some mothers, the practice of eating the placenta after giving birth is believed by some to help with postpartum depression, breast milk production and energy levels. It’s taken off in the last decade, touted by some celebrity moms and promoted on the internet. Now tens of thousands of U.S. moms do it, according to a rough estimate by researchers at the University of Nevada, Las Vegas. But in an unusual report published Thursday, a group of doctors and health officials say the capsules appear to have caused an infant’s illness in Portland, Oregon, last fall. The authors said moms should avoid taking them, noting that the making of placenta capsules is not regulated and there’s no guarantee they are free of harmful germs. The researchers include some lab scientists at the U.S. Centers for Disease Control and Prevention. A CDC spokeswoman said the agency hasn’t taken a formal position on placenta pills, and that the warning was the authors’ conclusion. Still, it’s perhaps the strongest statement to date by any medical authorities against the practice, said Sharon Young, a UNLV researcher who has studied the practice. She said there isn’t good medical evidence yet that it is beneficial. One UNLV study found placenta pills were a no better source of iron than dummy pills. ‘I’ve heard physicians say there’s no benefit to doing it, that it’s pointless. But I can’t remember a statement so strongly advising against it, from a physician or anyone,’ she said. Last fall, the Oregon baby fell ill twice with a strep infection. The first time, investigators believe the mom passed an infection to her child during birth. Later, the mom started taking placenta capsules. The child got sick again weeks later, and health officials think the pills played a role. Tests found the bacteria in the placenta pills. The mother had sent her placenta to a company that offers to clean, slice and dehydrate it, then grind it and put it into gelatin capsules, according to the report. What exactly is a placenta and what does it do? 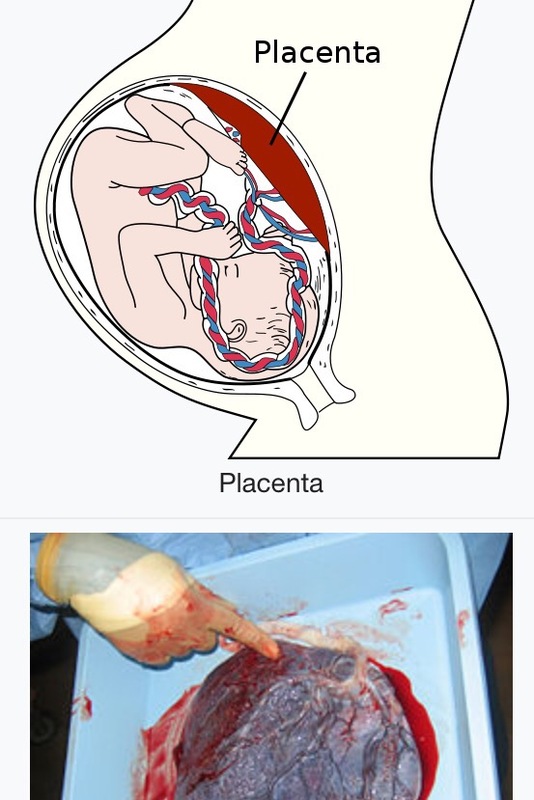 [The placenta is] an organ that connects the developing fetus to the uterine wall to allow nutrient uptake, provide thermo-regulation to the fetus, waste elimination, and gas exchange via the mother’s blood supply, fight against internal infection and produce hormones to support pregnancy. The placenta provides oxygen and nutrients to growing babies and removes waste products from the baby’s blood. How strange, biologically, is the practice of eating the placenta organ? Other mammals, goats for example, do eat their placentas. There is also a school of thought that holds that placentophagy naturally occurred to hide any trace of childbirth from predators in the wild. Many placental mammals participate in placentophagy, including herbivores; exceptions include Pinnipedia, Cetacea, camels and, in rare cases, humans. … Some research has shown that ingestion of the placenta can increase the pain threshold in pregnant rats. Rats that consumed the placenta experienced a modest amount of elevation of naturally occurring opioid-mediated analgesia. Endogenous opioids, such as endorphin and dynorphin, are natural chemicals, related to the opium molecule, that are produced in the central nervous system. Production of these endogenous opioids is increased during the birthing process. They have the ability to raise the threshold of pain tolerance in the mother. When coupled with ingested placenta or amniotic fluid, the opioid effect on pain threshold is dramatically increased. Rats that were given meat instead of the placenta showed no increase in the pain threshold. Is there any evidence that a human mother should eat her placenta? Our class discussion commences with differing opinions, theories, vague and distorted facts and many grunts of “ugh, gross!” It then becomes my job as the childbirth educator to sort this out and offer my students evidence based information with regards to placentophagy. There’s been quite a bit in the news this last week or so about placenta eating. Recently, Kim Kardashian, on her show, “Keeping up with the Kardashians,” queried her doctor about consuming her placenta after birth. She wanted to know if he thought that by consuming it, it would help keep her looking younger – a veritable fountain of youth. Kim asks her doctor during the episode. “Some people believe in that,” her doctor replies. In 2012, Mad Men star, January Jones let it be known that she consumed her encapsulated placenta after her baby was born, per her doula’s suggestion. This is a rather amazing list. It would appear that consuming placenta postpartum is a bit of a magic bullet. This, in and of itself, makes me wary of the claims. There are a number of oft cited studies to back these claims up. However, my research turns up only studies in animals, anthropological studies and a recent survey of mothers who consume placenta. Animal studies are good preliminary research and may provide indication for further study in humans. In and of themselves, they provide insufficient information to recommend placentophagy in human mothers. Anthropological studies are a fascinating peek into human evolution, history and practice. They may provide clues as to why humans, as a rule, do not consume placenta. Or for those limited cultures that did/do consume it, the rationale behind doing so may be revealed. However, as with animal studies, anthropology alone does not give us cause to say that we should or should not be participating in placentophagy. There is ongoing research out of Buffalo, NY by Mark Kristal, as well as from the University of Nevada, Las Vegas by Daniel Benyshek and Sharon Young on placentophagy. I look forward to their further contributions and hope their work provides impetus for additional hard science. While no scientific study has proven any benefits, a survey was conducted by American Medical anthropologists at the University of South Florida and University of Nevada, Las Vegas. Among the respondents, about 3/4 claimed to have positive experiences from eating their own placenta, citing “improved mood”, “increased energy”, and “improved lactation”. As a male, I can’t really even conceive of having a placenta, much less eating one, but my gut reaction is that Nature, in its evolutionary wisdom, expels what should leave the body. If it was really intended for consumption, I think it would smell edible and taste delicious to a new mother. 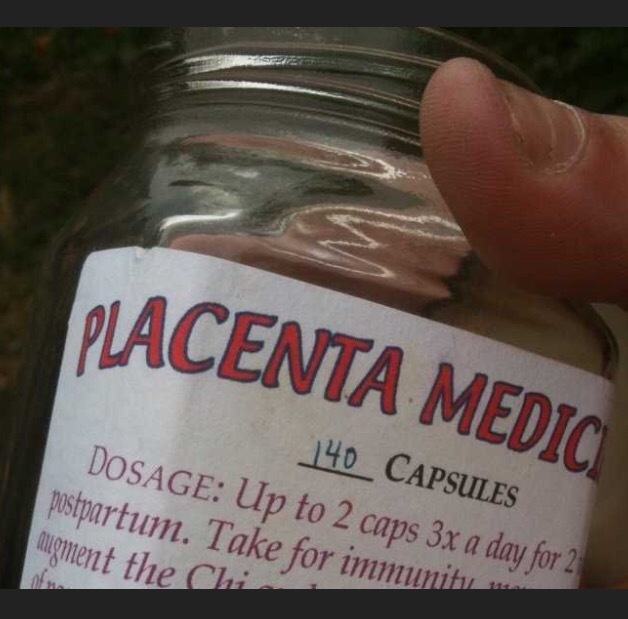 If you have to put it in a pill, I’m guessing the human placenta does not taste like a delicious streak. Who has tried it? Leave a comment for the curious if you have. Added: Here is a review of some evidence regarding eating the placenta.